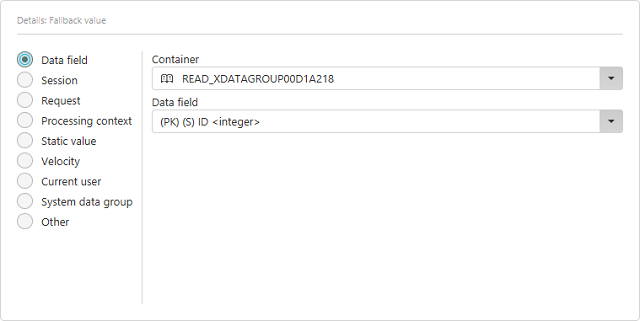 Select the desired container that contains the data field whose value should be used as the fallback value. 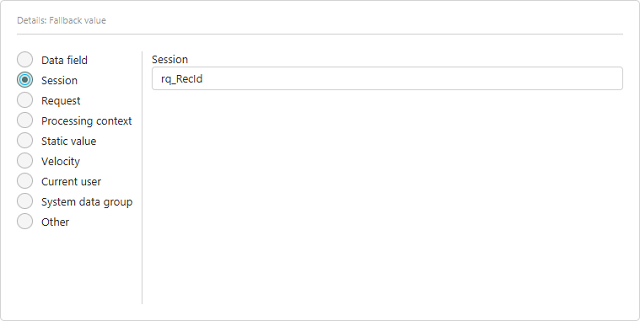 In each case, enter the corresponding name of the request parameter, session variable or variable from the processing context. 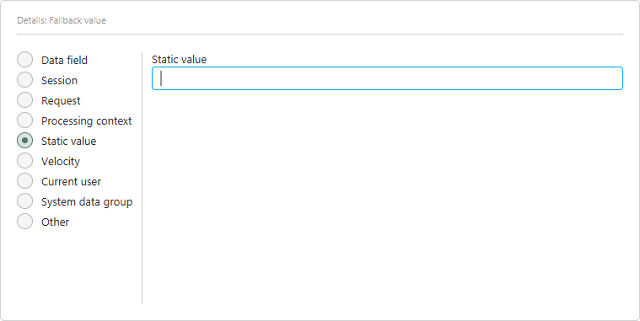 Enter a static value here. 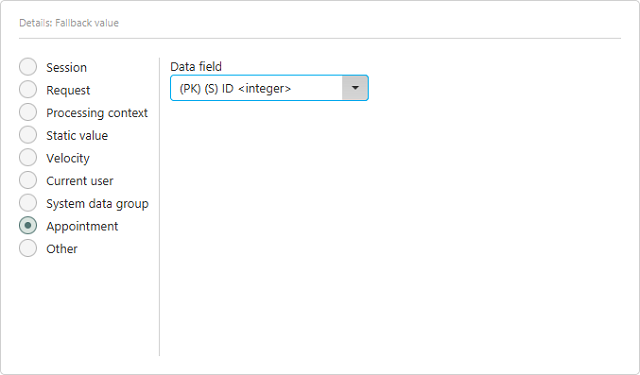 Any character string can be entered as long as it corresponds to the required data type. For example, if an integer value is required, "123" can be transferred, but "ABC" cannot. A Velocity script, which provides the fallback value, can be entered here. 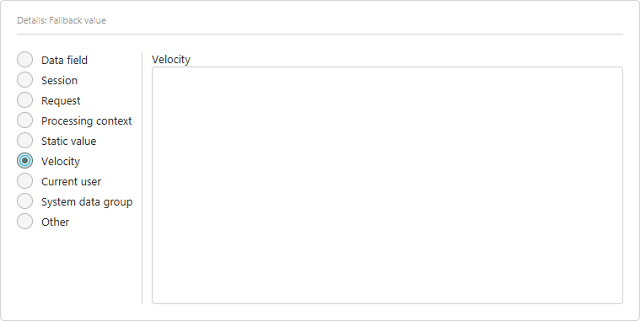 Velocity can only be implemented rudimentally for page parameters. Objects like $DC, $drRecord are not available at this put but if/else constructs can be used. 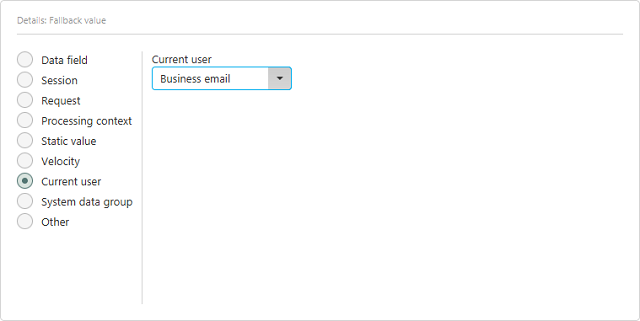 A data field from the User Manager can be selected here. 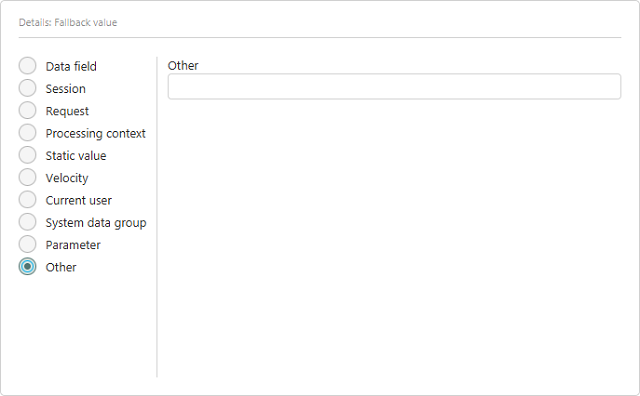 Select the application that contains the desired System data group. 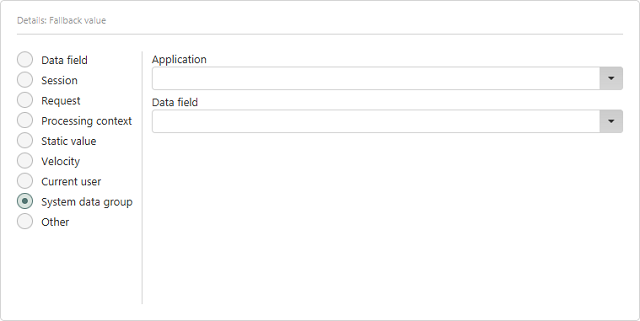 Select the corresponding data field here. 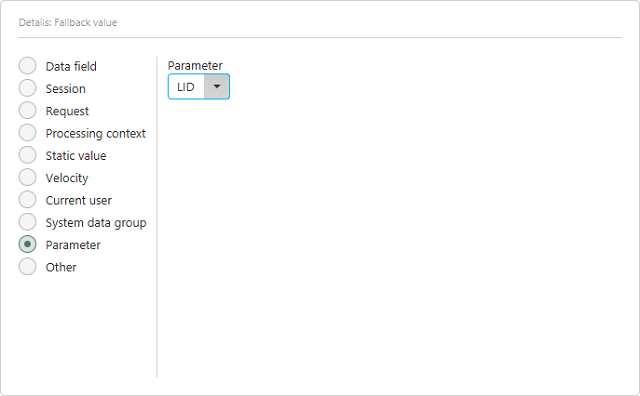 Select the desired parameter whose fallback values should be used. All parameters are the current page are available for selection. 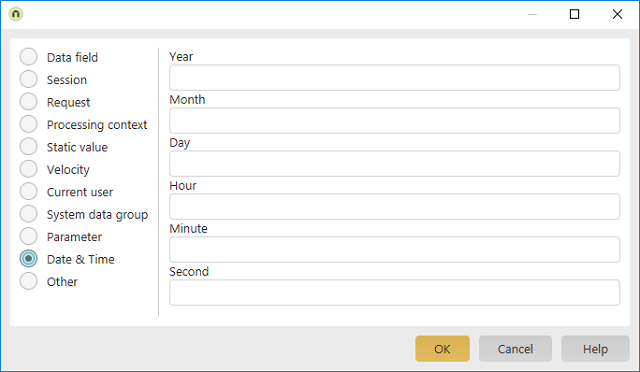 If a data field with the date/time, date or time control type is selected as the displayed value, the date can be adjusted here. Click here for more information about these settings. 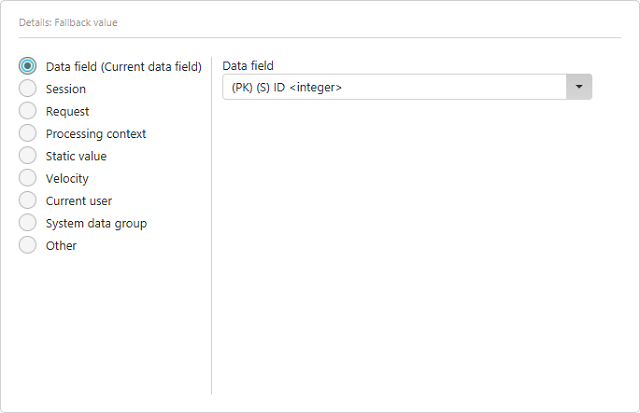 If a data field with the integer control type is selected, a counter can be set up with this option here. When a new data record is created, the value last entered will be increased by 1. This new value is used as the preset. Variable names, which for example come from custom Java classes, can be entered here. This option is only available for calendar plugins. All dates, which have been defined on the "General" tab of the plugin properties, can be selected here. This option is only available for calendar plugins if the setting "Enable display of resources" has been activated on the "Options" tab. 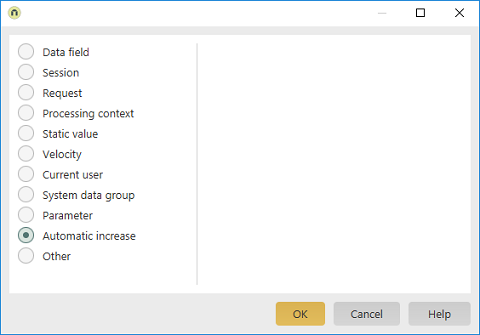 All data fields, which have been selected as the title field, sorting field, grouping field or image on the "Options" tab are available for selection. 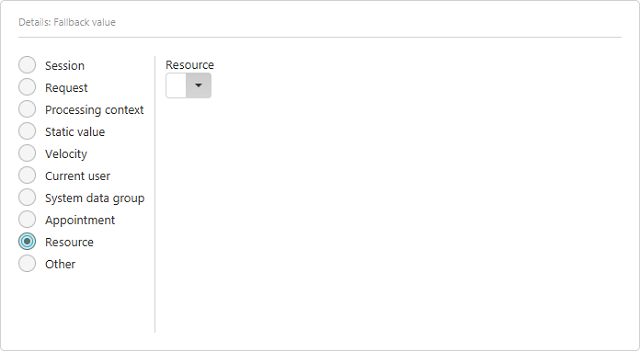 Select the corresponding resource data field here. This option is only available if a ReadContainer is not supported, such as in processes.